My kids keep growing up- my little man is in third grade now and Baby Strawberry started kindergarten! That leaves me at home with a baby and a toddler now that school has started. It's unbelievably quiet around the house now that my Chatty Kathy is back in school! I'm trying to get into a good routine and that includes more cooking and baking. Summer heat will end around here soon I hope (haha) and I am already pinning away baking recipes. I've delved into podcasts and try to read grown up books occasionally but seem to spend more time cleaning up after kids than I ever anticipate. Do you have any podcasts to recommend? I have The Mystery Show and This American Life on my queue but haven't gotten to them yet. My current and always struggle is the perfect chocolate chip cookie. This is the first recipe I ever made on my own and one I always come back to. I've had a few friends ask how I make mine so I'm recording my current method. I like my chocolate chip cookies chewy, chocolaty, and salty. Lots of brown sugar and evenly shaped through a cookie scoop. Temperature of dough, pans, and kitchens also seem to make a difference. I use a half sheet pan with a silpat. Has anyone tried the Amazon brand silicone mats? I have several name brand Silpats and a couple knock offs and have been pleasantly surprised. I would definitely recommend one with the cut off corners so it fits nicely in your sheet pan. If you end up using the same pan again, make sure it's cool before you scoop the dough onto the pan (sometimes I run mine under cool water once they've cooled to the touch). A note about the butter: I used to soften my butter until it was super super mushy. Recently I've decided that my cookies turn out better with cooler butter. My kitchen runs hot (Arizona problems) but I only set it out for five or ten minutes and then go for it. It's soft enough for the KitchenAid to make swift and thorough work of the butter but it still completely holds its shape. 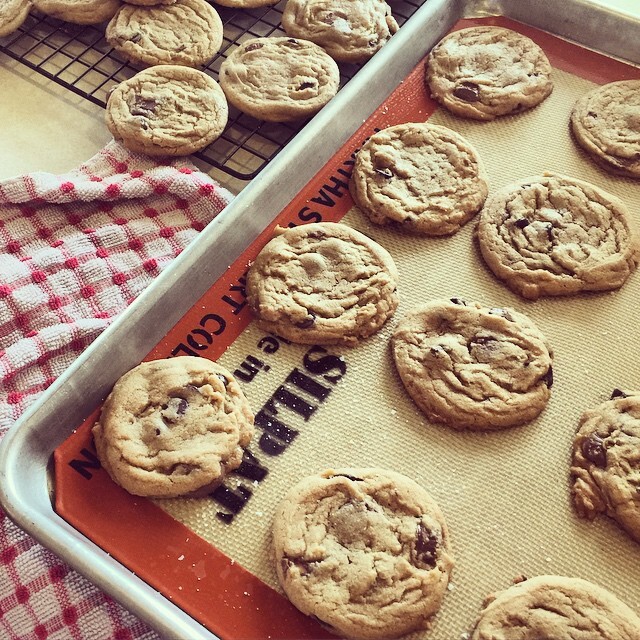 Do you have an ultimate chocolate chip recipe? I've made and posted them so many times but I'm always hunting for the elusive perfect one. I keep telling myself that even if they don't come out perfectly, they're still delicious (remember, "it doesn't have to be perfect to be beautiful!") My kids never object to a fresh batch! Cream sugars and butter in mixer for one minute. Beat in egg until thoroughly combined. Mix in vanilla. Add dry ingredients and slowly mix for about 30 seconds until combined. Mix in chocolate for about 10 seconds (or by hand with a spatula). Be careful not to over mix the dough once flour is added. 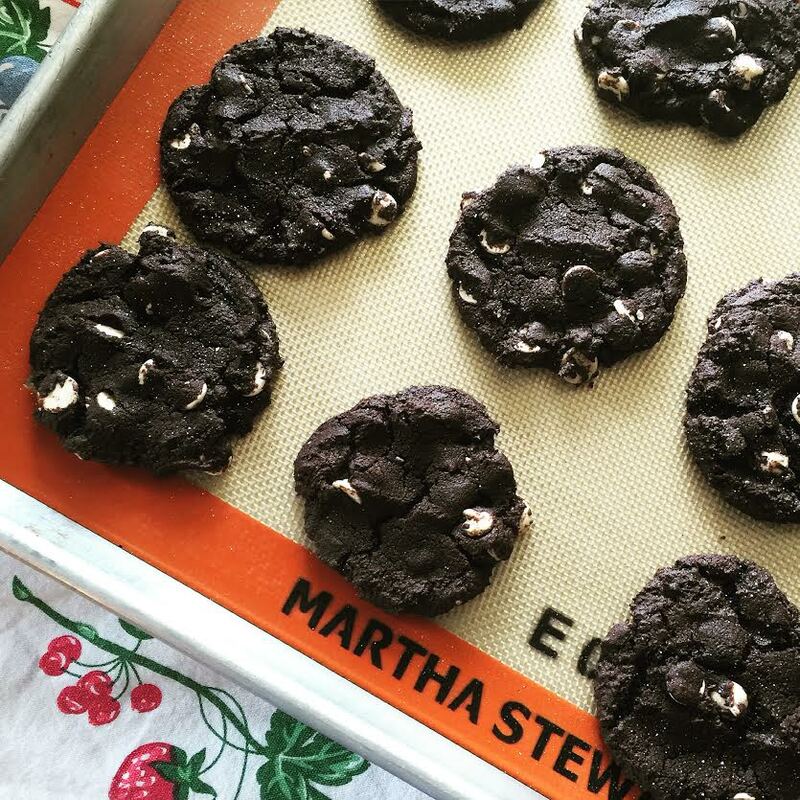 Scoop cookies onto cool cookie sheet lined with parchment paper or silicone mat. Sprinkle with a bit of salt. Bake 8-10 minutes. Remove cookies to cooling rack and enjoy.